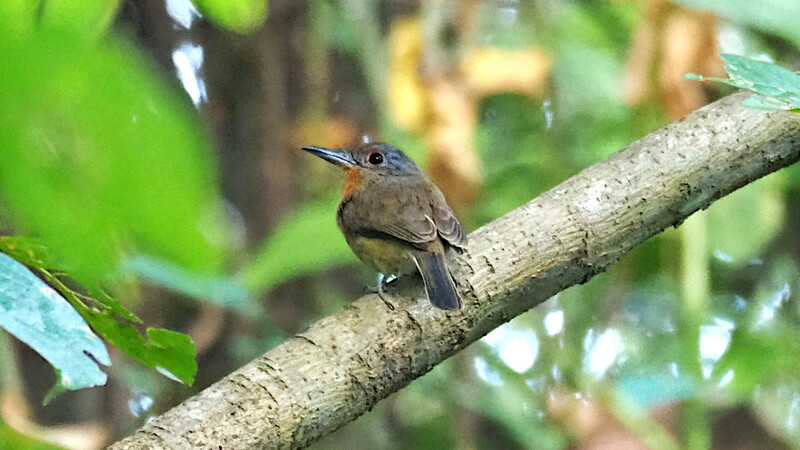 Though it has a spotty distribution in Panama, Gray-cheeked Nunlet is most readily seen in Darien. Photo by participant Marshall Dahl. We enjoyed a wonderful week of holiday birding in the warm climes of eastern Panama. This tour is geared to see the specialties of Darien Province and this year's tour did not disappoint and even had some bonuses. On our second day at the Canopy Camp we took a dugout canoe trip up a couple of rivers to the site of a Harpy Eagle nest. We enjoyed great views of the adult female tending to a chick. Seeing the most powerful of all raptors so well was a real treat and a wonderful way to celebrate New Year's Eve. Two days later we revised our itinerary and made another boat trip to the site of a Crested Eagle. This huge raptor is seen much less frequently than Harpy and it was a rare opportunity to see one at a nest. Again, we enjoyed watching a dark-morph female as she sat on the nest that emerged above the surrounding canopy. The rest of our birding tracked down lots of specialties and more widespread tropical birds. Highlights included a pair of beautiful Great Curassows walking about in the open, a couple of Capped Herons with one of them perched high in a tree, a White Hawk soaring over the Camp, great looks at all five neotropical kingfishers, the quite local Gray-cheeked Nunlet, Dusky-backed Jacamar, Spot-crowned Barbet working on a nesting cavity, the tiny Olivaceous Piculet, Golden-green Woodpecker, a pair of Red-throated Caracaras, a scope study of feeding Spectacled Parrotlets, spending time with five huge Great Green Macaws feeding in a close tree, male and female Black Antshrike, three Double-banded Graytails, stunning male Blue Cotingas, snapping Golden-collared Manakins, a quite rare Bicolored Wren, Song Wren, White-eared Conebill, and scope views of the quite range restricted Black Oropendola among others. It was a great thrill to see this dark-morph Crested Eagle at a nest site. This species is more rarely encountered than Harpy Eagle. Photo by participant Marshall Dahl. MUSCOVY DUCK (Cairina moschata) – We saw a group of three flying by over the El Salto Road. 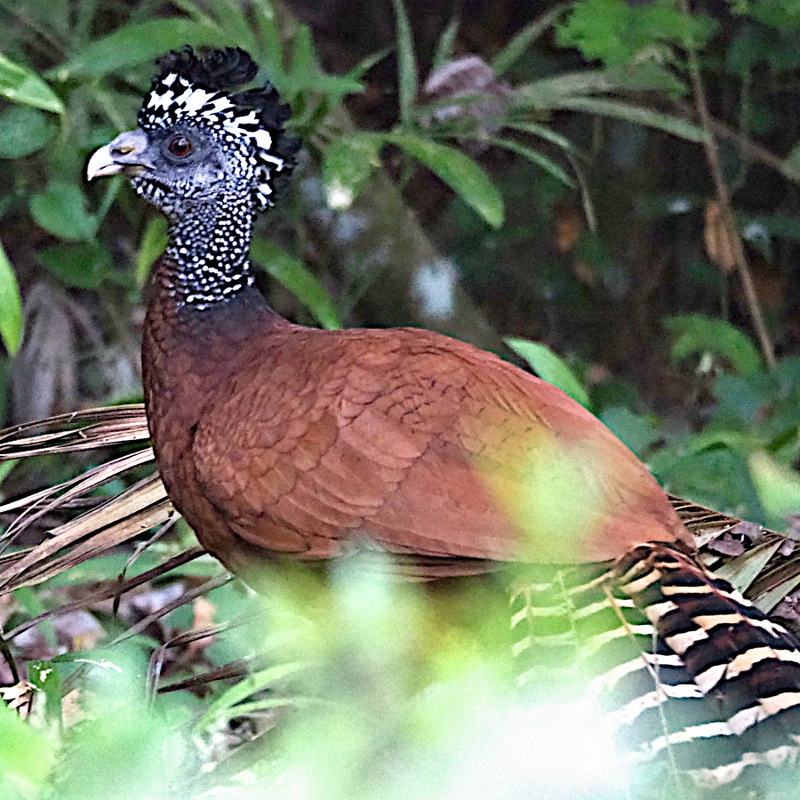 GREAT CURASSOW (Crax rubra) – We had great looks at a male and female when they came in to the garden of a house along the highway. These are usually quite shy birds and it is amazing they are regular here. The female is spectacularly plumaged. WOOD STORK (Mycteria americana) – We saw a handful flying about before we saw the large tree along the river with several nests. BROWN PELICAN (Pelecanus occidentalis) – A flock of at least 40 individuals was seen flying in a 'V' as we birded in the banana plantation. RUFESCENT TIGER-HERON (Tigrisoma lineatum) – We saw a couple of these handsome herons along the river to the Harpy Eagle site. COCOI HERON (Ardea cocoi) – A handful were seen along the rivers. LITTLE BLUE HERON (Egretta caerulea) – These were quite common along some of the rivers we boated. TRICOLORED HERON (Egretta tricolor) – Our first was along the Rio Torto, then we saw an immature along the river to the Harpy site. GREEN HERON (Butorides virescens) – At least one was seen as we got back to the boat landing along the Rip Chucunaque. CAPPED HERON (Pilherodius pileatus) – We saw two while birding the forest clearing on the El Salto Road. One of these handsome herons perched in a large tree for a scope view. YELLOW-CROWNED NIGHT-HERON (Nyctanassa violacea) – A few were seen along the big river out of Yaviza. BOAT-BILLED HERON (Cochlearius cochlearius) – Domi spotted one that was tucked into the vegetation at the lagoon we walked to near Nueva Vigia. GREEN IBIS (Mesembrinibis cayennensis) – We saw one along the Rio Membrillo. This Cinnamon Woodpecker, one of a genus of a dozen species of purely tropical woodpeckers, perched up for a great study at the Canopy Camp. Photo by participant Marshall Dahl. OSPREY (Pandion haliaetus) – We saw a perched individual at Lake Bayano on our first morning, then another one flying over the lake. PEARL KITE (Gampsonyx swainsonii) – Just after lunch on our final day we had pretty good views of one of these small raptors that was perched on a power line. CRESTED EAGLE (Morphnus guianensis) – This is a quite rare bird throughout its range. We made an originally unplanned excursion to a site where we saw a dark-morph female incubating at a nest that was high in a cuipo tree. The crest of this bird was clearly seen as it turned its head back and forth as it scanned the surrounding sky. This species is more rarely seen than the better-known Harpy Eagle, Yip! Yip! Yip! 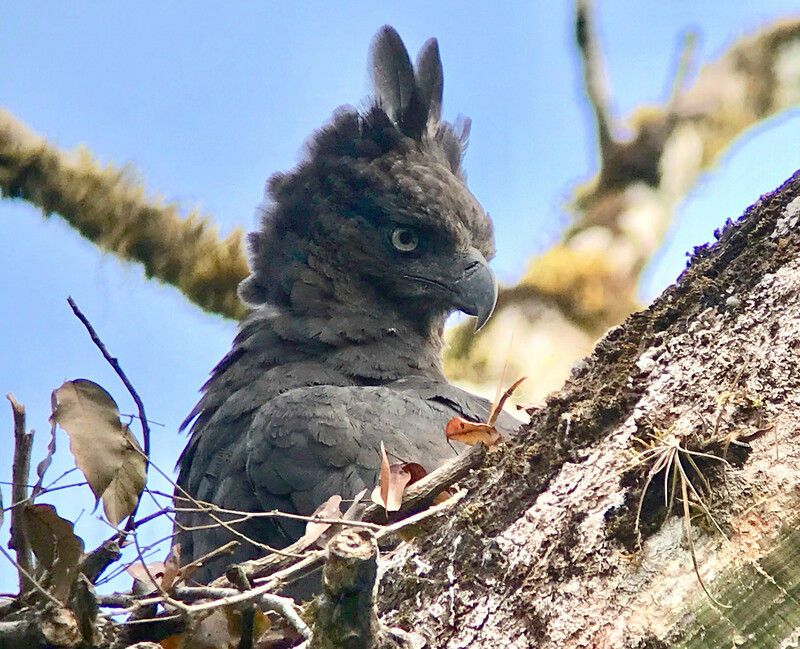 HARPY EAGLE (Harpia harpyja) – We had fabulous views of the large female adult at a nest with a three month old chick. It was well worth the boat trip by dugout canoe up two rivers to the site. With the possibility of a long wait to see an adult, it was thrilling to walk up to the site and see this incredibly large raptor tending to the chick in the nest. During the 1 1/2 hours we were nearby we saw the female make a short flight to another limb of the tree where it stayed until after we left. BLACK HAWK-EAGLE (Spizaetus tyrannus) – We saw one soaring high above near El Salto and heard a couple of others. BLACK-COLLARED HAWK (Busarellus nigricollis) – We saw two of these handsome raptors along the Rio Tuira. DOUBLE-TOOTHED KITE (Harpagus bidentatus) – One was spotted perched on a limb while we walked Nando's Trail at the Canopy Camp. CRANE HAWK (Geranospiza caerulescens) – We saw a few along the riverways during our boat trips. COMMON BLACK HAWK (MANGROVE) (Buteogallus anthracinus bangsi) – We saw one or two along the rivers. 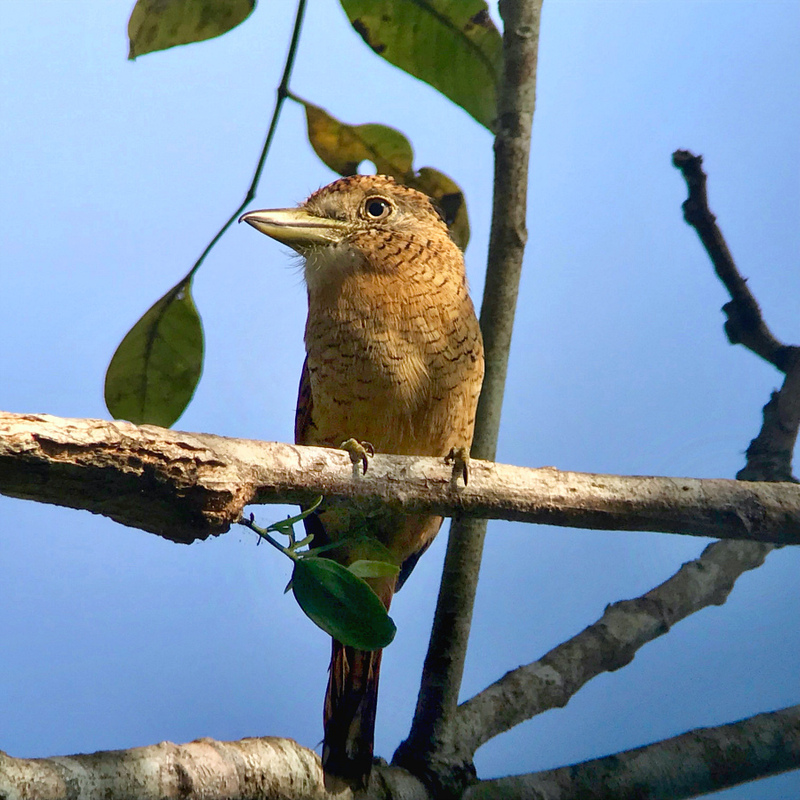 It took us awhile to finally track down a Barred Puffbird, a species that is often being mobbed by hummingbirds, as these puffbirds raid their nests. Photo by participant Marshall Dahl. ROADSIDE HAWK (Rupornis magnirostris) – This was a daily sighting. WHITE HAWK (Pseudastur albicollis) – Domi heard then spotted a calling individual soaring above the clearing at the Canopy Camp. BROAD-WINGED HAWK (Buteo platypterus) – A few of these wintering birds from North America were seen during the week. SHORT-TAILED HAWK (Buteo brachyurus) – We had good views of one on our second day at the Camp. PURPLE GALLINULE (Porphyrio martinica) – Our first one was a young bird that was standing in the dirt road on our way to our first boat trip. It didn't seem like it wanted to move. KILLDEER (Charadrius vociferus) – A quite uncommon wintering bird in Panama; we saw one along the Rio Torti on our first day. It was a lifer for Domi. SPOTTED SANDPIPER (Actitis macularius) – These were quite prevalent on a couple of the river trips. SCALED PIGEON (Patagioenas speciosa) – Two were seen sitting in tree tops on our morning along the El Salto Road. GRAY-CHESTED DOVE (Leptotila cassinii) – Domi had one in the scope briefly at San Francisco Reserve. GREATER ANI (Crotophaga major) – We saw good numbers of these in a couple of places and heard their odd calls at the lagoon near Nueva Vigia. STRIPED CUCKOO (Tapera naevia) – This was a species we heard everyday that we were in suitable habitat, but we had a great look at one that Stefan spotted as it was dust bathing at the edge of the road. LITTLE CUCKOO (Coccycua minuta) – A real skulker. We ended up with pretty fair looks at this rather uncommon species near Nueva Vigia. COMMON PAURAQUE (Nyctidromus albicollis) – With our early morning departures, we saw a handful perched in the road where they were hunting during the night. BAND-RUMPED SWIFT (Chaetura spinicaudus) – A group was flying about us on the Rio Membrillo on the way to the Harpy Eagle site. One of the specialties of Darien, Dusky-backed Jacamar was only recently found in the area near the Canopy Camp. Photo by participant Marshall Dahl. WHITE-NECKED JACOBIN (Florisuga mellivora) – This was one of the species that was visiting the feeders at the Camp. PALE-BELLIED HERMIT (Phaethornis anthophilus) – We only had a few fly-bys of this local species. BLACK-THROATED MANGO (Anthracothorax nigricollis) – The only hummingbird we saw each day. They were seen around the Camp but were most prevalent at the feeders at the restaurant at Torti. LONG-BILLED STARTHROAT (Heliomaster longirostris) – This is not a species that is normally seen visiting hummingbird feeders, but we saw it a few times at each visit to the feeders in Torti. SCALY-BREASTED HUMMINGBIRD (Phaeochroa cuvierii) – This part of Panama is the only place I have been where I find this species to be fairly common. BLUE-CHESTED HUMMINGBIRD (Amazilia amabilis) – A rather common species at the Verbena flowers at the Camp. SNOWY-BELLIED HUMMINGBIRD (Amazilia edward) – Another species that we only saw at the feeders at the restaurant at Torti. SAPPHIRE-THROATED HUMMINGBIRD (Lepidopyga coeruleogularis) – A dazzler in good light; we saw a few, with good looks at the feeders. VIOLET-BELLIED HUMMINGBIRD (Juliamyia julie) – A couple were seen most days around the Canopy Camp. BLUE-THROATED GOLDENTAIL (Hylocharis eliciae) – After a fly-by or two we ended up with a perched view of one at the flowers at the Camp. BLACK-TAILED TROGON (Trogon melanurus) – It took us a while to see a male after spotting a few females early in the week. WHITE-TAILED TROGON (Trogon chionurus) – We saw a female on Nando's Trail at the Camp. GARTERED TROGON (Trogon caligatus) – Some saw this colorful species from the boat on the way to Nueva Vigia. 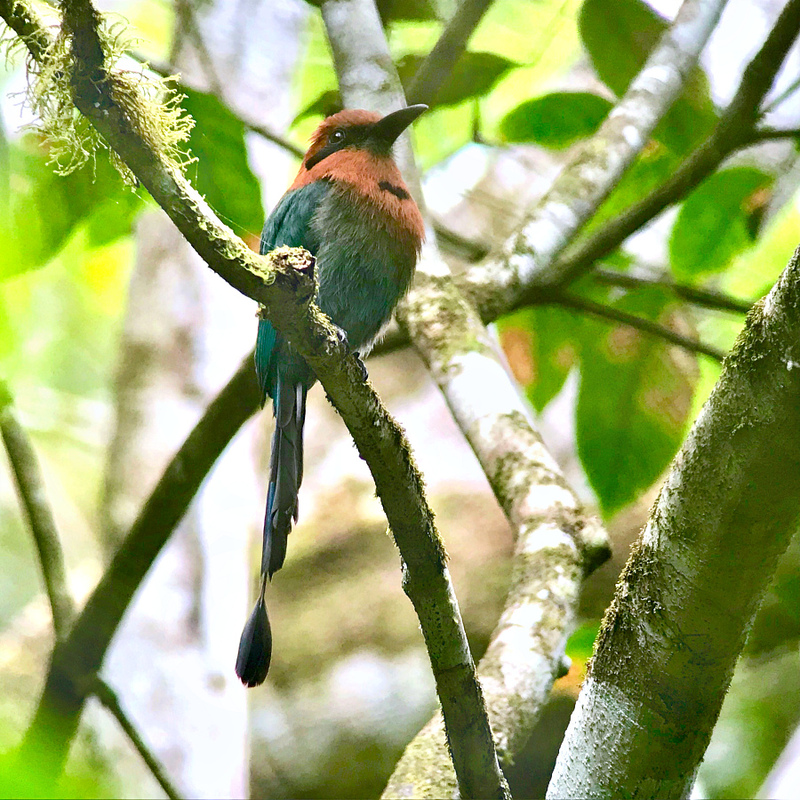 WHOOPING MOTMOT (Momotus subrufescens) – Formerly know as Blue-crowned Motmot, we saw it at the Camp. Great Curassow is usually a very shy species that is difficult to see, but this female was strutting around the garden of a house along the Pan-American Highway. Photo by participant Marshall Dahl. BROAD-BILLED MOTMOT (Electron platyrhynchum) – A calling bird performed well at San Francisco Reserve and posed nicely for us. RINGED KINGFISHER (Megaceryle torquata) – There were a good number seen along most of the rivers we traveled. AMAZON KINGFISHER (Chloroceryle amazona) – This was another commonly seen bird along the rivers. 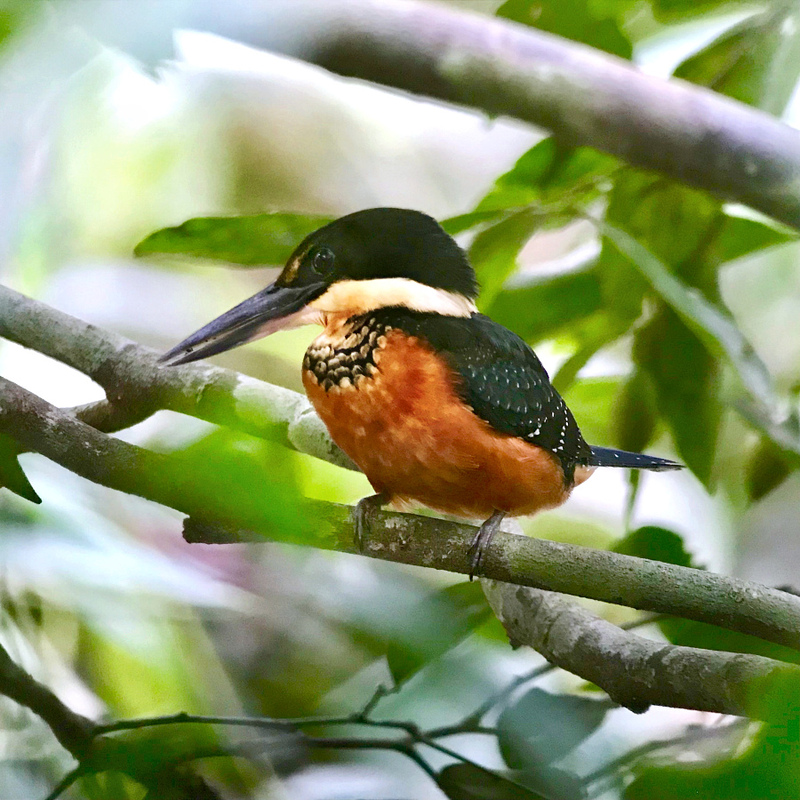 GREEN KINGFISHER (Chloroceryle americana) – Only one or two were seen along the Rio Chucunaque and its tributaries. GREEN-AND-RUFOUS KINGFISHER (Chloroceryle inda) – We had nice views of this wonderful bird at the lagoon we walked to near Nueva Vigia. This is the least seen of the six species of New World kingfishers. AMERICAN PYGMY KINGFISHER (Chloroceryle aenea) – We had a great scope look at this tiny kingfisher at the lagoon near Nueva Vigia. WHITE-NECKED PUFFBIRD (Notharchus hyperrhynchus) – We saw a few during the week. PIED PUFFBIRD (Notharchus tectus) – After a quick sighting from one of the boats, we all had a good view of this small puffbird on our last morning. BARRED PUFFBIRD (Nystalus radiatus) – Another quite local species in Panama; we had nice scope views at the banana plantation near Nueva Vigia. WHITE-WHISKERED PUFFBIRD (Malacoptila panamensis) – Two of these forest dwelling puffbirds were spotted at San Francisco Reserve after we heard their high-pitched calls. GRAY-CHEEKED NUNLET (Nonnula frontalis stulta) – One of the real specialties of the Darien area. We had great views during our first morning at the Camp then another two or three near Nueva Vigia. DUSKY-BACKED JACAMAR (Brachygalba salmoni) – A very local bird in eastern Panama; we had great scope views of one that perched out quite well for us. 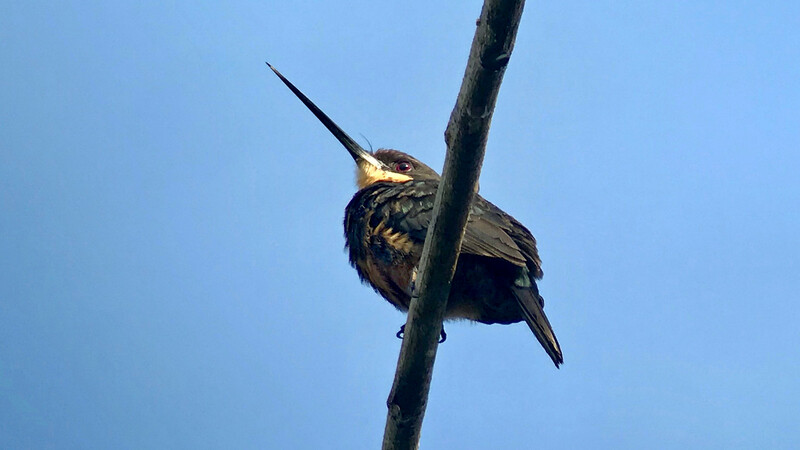 RUFOUS-TAILED JACAMAR (Galbula ruficauda) – Like a giant hummingbird, these glossy green birds seem like a dart as they fly through the trees. SPOT-CROWNED BARBET (Capito maculicoronatus rubrilateralis) – We watched a pair of these odd birds excavating a nest hole in a Cecropia tree near the Canopy Camp. YELLOW-THROATED TOUCAN (CHESTNUT-MANDIBLED) (Ramphastos ambiguus swainsonii) – We saw a few of these large toucans around the Camp. KEEL-BILLED TOUCAN (Ramphastos sulfuratus) – We heard or saw this fancy species each day. OLIVACEOUS PICULET (Picumnus olivaceus) – On our first morning at the Camp we found this small woodpecker tapping away on a thin branch. GOLDEN-GREEN WOODPECKER (Piculus chrysochloros) – We managed to track down this nice looking woodpecker along the El Salto Road. SPOT-BREASTED WOODPECKER (Colaptes punctigula) – Our only sighting was along the Rio Torti during our first morning. CINNAMON WOODPECKER (Celeus loricatus) – One of a genus of fabulous woodpeckers, we had a great view in the small clearing just down the road from the Camp. LINEATED WOODPECKER (Dryocopus lineatus) – We saw a few, with our best view being the one that was really tearing into the small trunk of a Cecropia tree along the El Salto Road. The display lek of several male Golden-collared Manakins along the trail at the Canopy Camp afforded us great views of these birds as they snapped and popped. Photo by participant Marshall Dahl. RED-THROATED CARACARA (Ibycter americanus) – Our driver, Oscar, spotted two individuals in the Alagandi area that seemed to be working on a termite nest. YELLOW-HEADED CARACARA (Milvago chimachima) – We saw these cruising the highway each time we ventured out. BAT FALCON (Falco rufigularis) – A single bird was seen at Lake Bayano on our first morning, but it got away quickly. ORANGE-CHINNED PARAKEET (Brotogeris jugularis) – These were a common sight around the Camp and many places we birded, but we only scoped them once or twice. 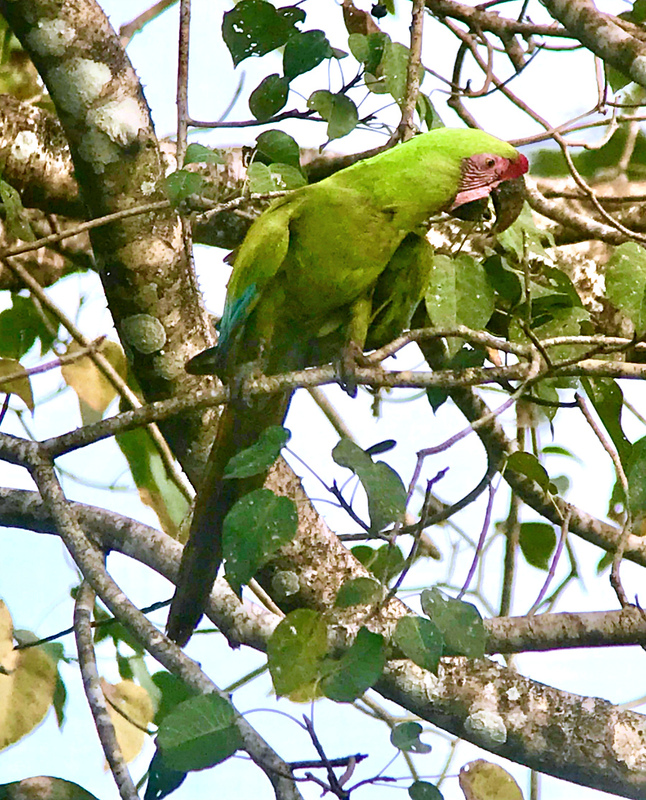 RED-LORED PARROT (Amazona autumnalis) – We had a few scope views of these rather common parrots. SPECTACLED PARROTLET (Forpus conspicillatus) – A quite rare bird in Panama. Domi spotted two individuals that were feeding quietly in a small tree in the banana plantation near Nueva Vigia. GREAT GREEN MACAW (Ara ambiguus) – We had a fabulous experience with four, then five, individuals that flew past, then circled and came in to land in a fruiting tree right in front of us. We watched them feeding for quite awhile and it was hard to leave. CHESTNUT-FRONTED MACAW (Ara severus) – A much smaller macaw than the above. A few of us saw a pair along the Rio Chucunaque before we had a flyby later in the week. BARRED ANTSHRIKE (Thamnophilus doliatus) – We were just on the eastern edge of the range of this species when we saw it at Lake Bayano on our first morning. BLACK-CROWNED ANTSHRIKE (Thamnophilus atrinucha) – We saw a few in mixed-species flocks in the bigger forest areas. This was formerly known as Western Slaty-Antshrike. BLACK ANTSHRIKE (Thamnophilus nigriceps) – A Darien specialty. We had wonderful views of a pair at the edge of the Canopy Camp property on our first morning there. Great Green Macaw has a patchy distribution in Panama and Costa Rica, and is usually seen flying above a distant ridge. It was extraordinary to watch five individuals fly into a tree just in front of us where they began feeding on small fruits. Photo by participant Marshall Dahl. PACIFIC ANTWREN (Myrmotherula pacifica) – This nicely marked small antbird was seen along the Rio Torti on our first morning. WHITE-FLANKED ANTWREN (Myrmotherula axillaris) – A couple or three were seen with forest flocks. DOT-WINGED ANTWREN (Microrhopias quixensis) – A pair was seen in a flock at the Tierra Nueva reserve. JET ANTBIRD (Cercomacra nigricans) – Usually a skulker that is hard to see in thick vegetation, we had a nice view at Lake Bayano at an individual that got up fairly high in a tree. BARE-CROWNED ANTBIRD (Gymnocichla nudiceps) – A female was glimpsed by some but this was a heard only in reality. WHITE-BELLIED ANTBIRD (Myrmeciza longipes) – We worked on this one for a while before we got pretty good views at the Canopy Camp. We heard these almost everyday. NORTHERN BARRED-WOODCREEPER (Dendrocolaptes sanctithomae) – Walking back from the Crested Eagle nest, we ran into a flock that had one of these large woodcreepers with it. BLACK-STRIPED WOODCREEPER (Xiphorhynchus lachrymosus) – A sharply marked woodcreeper; we saw two in the mixed-flock near the Crested Eagle nest. RED-BILLED SCYTHEBILL (Campylorhamphus trochilirostris) – After our first one got away with only a quick view, we saw another quite well at Alagandi. The bill on this woodcreeper is quite impressive. STREAK-HEADED WOODCREEPER (Lepidocolaptes souleyetii) – This was the most common woodcreeper we encountered. DOUBLE-BANDED GRAYTAIL (Xenerpestes minlosi) – Another specialty of Darien; we heard a few and had our best views of what turned out to be three individuals along the El Salto Road. BROWN-CAPPED TYRANNULET (Ornithion brunneicapillus) – We had amazingly good views of this canopy species at the Camp. YELLOW TYRANNULET (Capsiempis flaveola) – Often a tough one to get a good look at, we saw it well at Rio Torti. YELLOW-CROWNED TYRANNULET (Tyrannulus elatus) – This was a common vocalization around the clearing. FOREST ELAENIA (Myiopagis gaimardii) – We had good views of a handful of individuals. SOOTY-HEADED TYRANNULET (Phyllomyias griseiceps) – One that we heard along the El Salto Road popped out for a pretty good view. SOUTHERN BENTBILL (Oncostoma olivaceum) – We finally caught up with this bird at San Francisco Reserve. BLACK-HEADED TODY-FLYCATCHER (Todirostrum nigriceps) – A pretty cool looking small flycatcher. We saw it quite well during our first morning at the Camp. YELLOW-BREASTED FLYCATCHER (Tolmomyias flaviventris) – Mostly a South American species, this is a very local bird in Panama and we had a couple of nice looks at it. ROYAL FLYCATCHER (NORTHERN) (Onychorhynchus coronatus mexicanus) – We saw one at the lagoon near Nueva Vigia and another at San Francisco Reserve. Alas, once again it did not raise it's crest. RUDDY-TAILED FLYCATCHER (Terenotriccus erythrurus) – We had a few in flocks, but one along Nando's Trail that lit just six feet from us was extraordinary. TROPICAL PEWEE (Contopus cinereus) – Two individuals showed well at San Francisco Reserve. 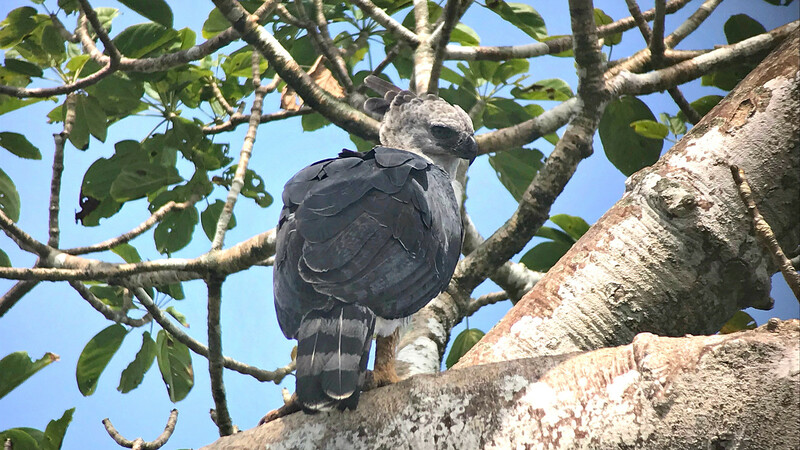 We had a fantastic experience watching this female Harpy Eagle hanging around its nest, even though we had to hike to it from one of the multitude of rivers in Darien. Photo by participant Marshall Dahl. PIED WATER-TYRANT (Fluvicola pica) – Stefan saw one along the Rio Chucunaque on our way to the Crested Eagle nest. LONG-TAILED TYRANT (Colonia colonus) – We saw two of these sharply marked flycatchers that perched out well for us. That's what they do. BRIGHT-RUMPED ATTILA (Attila spadiceus) – We heard a few and saw one along the El Salto Road. CHOCO SIRYSTES (Sirystes albogriseus) – It was somewhat of a surprise to hear this bird along the El Salto Road and then see three individuals. Domi said he had not heard them here for quite awhile. PANAMA FLYCATCHER (Myiarchus panamensis) – Our first was at Lake Bayano. GREAT CRESTED FLYCATCHER (Myiarchus crinitus) – These wintering birds from North America were calling quite a bit in the forest. LESSER KISKADEE (Pitangus lictor) – We saw many along the rivers we traversed. RUSTY-MARGINED FLYCATCHER (Myiozetetes cayanensis) – We saw these daily and they were conspicuous around the clearing at the Camp. SOCIAL FLYCATCHER (Myiozetetes similis) – Our only one was at Lake Bayano on our first stop. GRAY-CAPPED FLYCATCHER (Myiozetetes granadensis) – Another local species in Panama. We saw one at the banana plantation near Nueva Vigia. 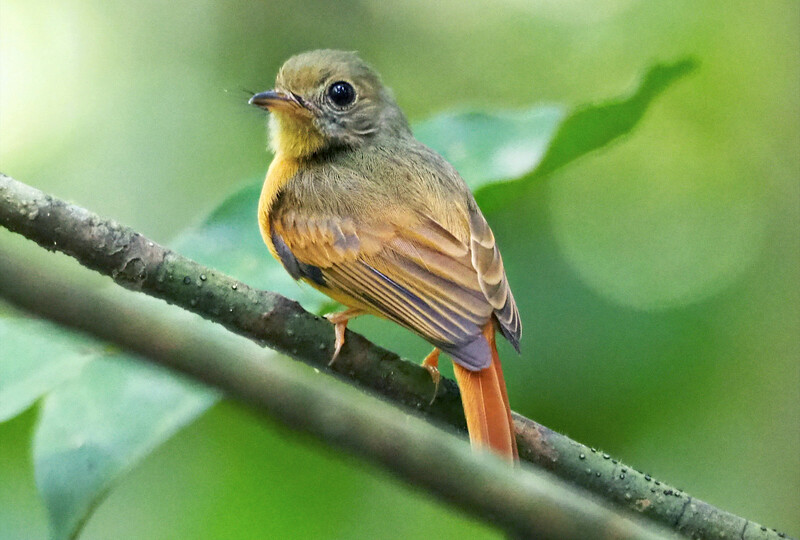 PIRATIC FLYCATCHER (Legatus leucophaius) – This species, which takes over the nests of other birds once they are built, is a migrant coming north from South America to breed. We saw and heard them at the Camp each day, where they had just returned. FORK-TAILED FLYCATCHER (Tyrannus savana) – At a couple of sites we saw a few of these distinctive flycatchers. One of the last new birds of our week, this Broad-billed Motmot gave us good views at San Francisco Reserve. Photo by participant Marshall Dahl. PURPLE-THROATED FRUITCROW (Querula purpurata) – It was a bit surprising that we did not hear these earlier in the trip but we finally caught up with a pair at San Francisco Reserve. BLUE COTINGA (Cotinga nattererii) – Along the El Salto Road we saw about three of these brilliantly colored males. GOLDEN-COLLARED MANAKIN (Manacus vitellinus) – Along Nando's Trail we enjoyed watching a handful of males snapping and popping at a display lek. GOLDEN-HEADED MANAKIN (Ceratopipra erythrocephala) – We saw a nice male along Nando's Trail. RUSSET-WINGED SCHIFFORNIS (Schiffornis stenorhyncha panamensis) – Near the Crested Eagle nest, we called one of these rather drab but interesting birds in. It flew right past us twice but would not come in for a view. CINNAMON BECARD (Pachyramphus cinnamomeus) – There was a pair at the clearing with the Verbena flowers that we saw each time we visited. WHITE-WINGED BECARD (Pachyramphus polychopterus) – We saw an immature male near Lake Bayano on our first morning. SCRUB GREENLET (Hylophilus flavipes) – We had nice views, pale eye and all, near the Rio Torti. YELLOW-GREEN VIREO (Vireo flavoviridis) – One showed pretty well at Lake Bayano on our first morning. BLACK-CHESTED JAY (Cyanocorax affinis) – We had several good views of this large tropical jay. SOUTHERN ROUGH-WINGED SWALLOW (Stelgidopteryx ruficollis) – Many were seen along the rivers. MANGROVE SWALLOW (Tachycineta albilinea) – Good numbers were seen along the rivers where they perched on the logs and branches protruding from the water. HOUSE WREN (Troglodytes aedon) – Most of those we recorded were right at the Camp. WHITE-HEADED WREN (Campylorhynchus albobrunneus harterti) – We had quite good luck with seeing this large wren species quite low to the ground, which is unusual. BICOLORED WREN (Campylorhynchus griseus) – A very rare bird in Panama. We had one silent bird at Yaviza that got away before we could all get a look at it. This species was just found in Panama for the first time a few years ago as it spread up from South America. BLACK-BELLIED WREN (Pheugopedius fasciatoventris) – We ended up with pretty good sightings of a pair along the El Salto Road. ISTHMIAN WREN (Cantorchilus elutus) – Formerly part of the Plain Wren complex; we saw one that we first heard singing near Lake Bayano. SONG WREN (Cyphorhinus phaeocephalus) – We had one along the steep slope at San Francisco Reserve that we first heard giving its odd musical song. BLACK-CAPPED DONACOBIUS (Donacobius atricapilla) – We saw one at the roadside marsh just as it was getting dark. This used to be in the wren family but is now the sole member of its family. While walking Nando’s Trail at the Canopy Camp, this Ruddy-tailed Flycatcher came in to investigate us and perched only six feet away. Photo by participant Marshall Dahl. NORTHERN WATERTHRUSH (Parkesia noveboracensis) – Mostly a heard bird, but but we saw a couple along the river banks and there was one that inhabited the small forested arroyo at the Camp. GOLDEN-WINGED WARBLER (Vermivora chrysoptera) – We saw two of these great North American nesting warblers in the Nueva Vigia area. BAY-BREASTED WARBLER (Setophaga castanea) – This was the most commonly seen wintering warbler we encountered. CHESTNUT-SIDED WARBLER (Setophaga pensylvanica) – We only saw a couple. These were quite a bit more common in this part of Panama in years gone by. BUFF-RUMPED WARBLER (Myiothlypis fulvicauda) – This was one of the first birds we saw along Nando's Trail at the Canopy Camp. A singing bird that was up the creek came in and worked along a log up the slope. WHITE-SHOULDERED TANAGER (Tachyphonus luctuosus) – These were seen in a few flocks we encountered in the forest. FLAME-RUMPED TANAGER (Ramphocelus flammigerus) – Our only ones were along the Rio Torti. GOLDEN-HOODED TANAGER (Tangara larvata) – Though we saw them everyday, it took awhile before we got a good group view. PLAIN-COLORED TANAGER (Tangara inornata) – Aptly named. BLUE DACNIS (Dacnis cayana) – We saw a few, with most of those around the Camp. RED-LEGGED HONEYCREEPER (Cyanerpes cyaneus) – We had two in the scope near Nueva Vigia. 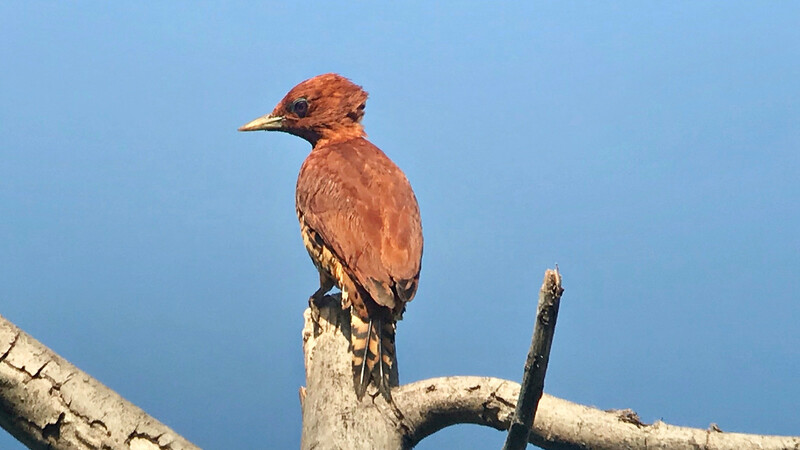 We saw this female Green-and-rufous Kingfisher at the lagoon near the village of Nuevo Vigia; this is the rarest of the New World kingfishers. Photo by participant Marshall Dahl. WHITE-EARED CONEBILL (Conirostrum leucogenys) – This is another Darien specialty that we saw a couple of times, with the best ones at Alagandi. STREAKED SALTATOR (Saltator striatipectus) – Our only sighting was near Lake Bayano. SUMMER TANAGER (Piranga rubra) – We saw a blotchy male, and a female or two, and heard a few others. ROSE-BREASTED GROSBEAK (Pheucticus ludovicianus) – We saw a female along the road at Sanson Abajo. RED-BREASTED MEADOWLARK (Sturnella militaris) – We had a few nice looks at this colorful open country species. CRESTED OROPENDOLA (Psarocolius decumanus) – These were far outnumbered by the following, but we saw a few and heard the gurgling display call. CHESTNUT-HEADED OROPENDOLA (Psarocolius wagleri) – A near constant sight at the Canopy Camp; we saw a few nest trees. BLACK OROPENDOLA (Psarocolius guatimozinus) – Another specialty of Darien. We hung around the Pan-American Highway near Yaviza and had a nice fly-by individual that showed the blue facial spot well. Then we found a perched individual for a good scope view. ORCHARD ORIOLE (Icterus spurius) – Our first was in the cemetery in Yaviza. YELLOW-BACKED ORIOLE (Icterus chrysater) – This one came in from a long way off at San Francisco Reserve. ORANGE-CROWNED ORIOLE (Icterus auricapillus) – A very local species; we saw two at the Canopy Camp on our first morning. GIANT COWBIRD (Molothrus oryzivorus) – A couple were spotted along the El Salto Road. YELLOW-HOODED BLACKBIRD (Chrysomus icterocephalus) – One appeared briefly in the marsh along the highway at dusk. 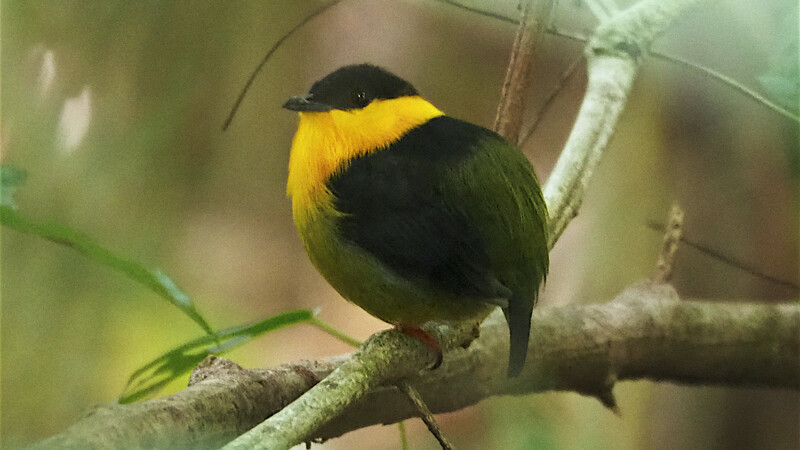 YELLOW-CROWNED EUPHONIA (Euphonia luteicapilla) – We saw several over the course of the week. THICK-BILLED EUPHONIA (Euphonia laniirostris) – One was seen at the Camp on our first morning there. FULVOUS-VENTED EUPHONIA (Euphonia fulvicrissa) – We saw a couple in the Alagandi area. COMMON OPOSSUM (Didelphis marsupialis) – We saw two of these during our night birding at the Camp. RED-NAPED TAMARIN (Saguinus geoffroyi) – We saw these quite colorful primates a couple of times, including one that fell out of a tree and crashed nearby. it shook it off and climbed back up. MANTLED HOWLER MONKEY (Alouatta palliata) – We heard them a lot and saw several troops in the trees along the rivers we boated along. WHITE-THROATED CAPUCHIN (Cebus capucinus) – Our best sightings were at Camp where they came to the feeders for bananas. BROWN-THROATED THREE-TOED SLOTH (Bradypus variegatus) – We ended up seeing a few at Tierra Nueva. WHITE-NOSED COATI (Nasua narica) – One was hanging around the feeders at the camp.